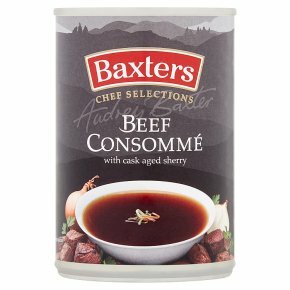 A deliciously rich beef stock, flavoured with pepper, onion and finally a touch of cask aged sherry are combined to make this wonderfully refined clear soup. Please Note: All cooking appliances vary. This is a guide only. Check product is piping hot before serving. Do not reheat once cooled. Cat D 750W - 3 1/2 mins, Cat E 850W - 3 mins.Empty contents into a microwaveable container and cover. Stir halfway through cooking. Empty contents into a saucepan and heat gently for 3-4 minutes, stirring occassionally.Do not boil.